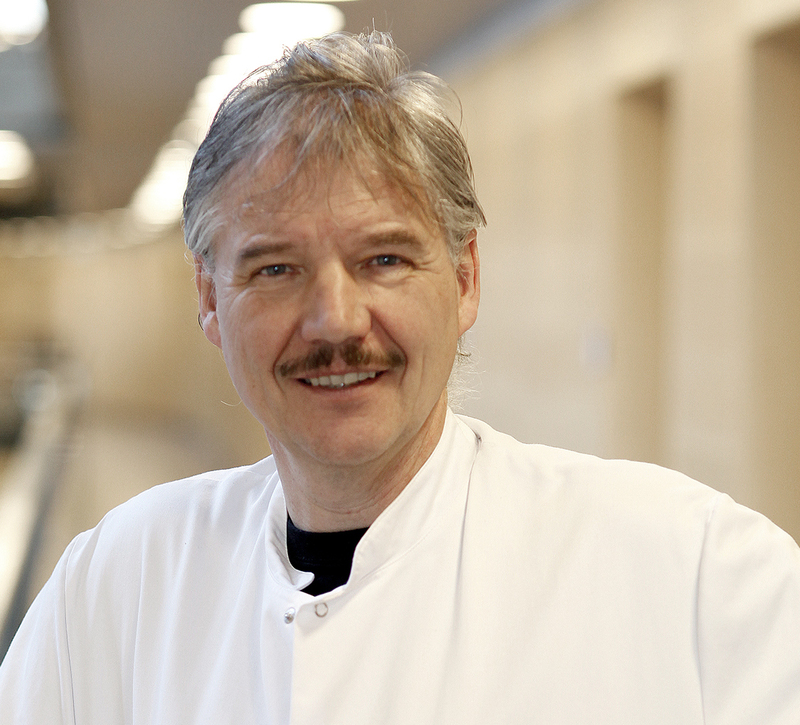 Dr. Asbjørn Mohr Drewes, MD, PhD, is a widely-recognized expert in gastroenterology and pain, especially in diseases of the pancreas and oesophagus. Acting as both a clinician and researcher, he has authored 507 peer-reviewed articles, book chapters, and reviews, and is a frequent speaker at international conferences. He is currently the Director of Mech-Sense and Center for Pancreatic Diseases at the Aalborg University Hospital in Aalborg, Denmark. Chronic pancreatitis (CP) is a poorly understood disease, to the immense frustration of patients, clinicians, and researchers. There is good news: consensus guidelines on chronic pancreatitis pain have been developed by an international team of experts. The task now is to make clinicians and patients aware of them. Abdominal pain is the most prevalent symptom of chronic pancreatitis, yet chronic pain is notoriously difficult to assess and treat. Doctors must often rely on patients’ descriptions of their pain, but they tend to distrust these reports. Doctors, and sometimes family and community members, may dismiss patients’ complaints of chronic pain as exaggerated, or view the patients as overly sensitive. When chronic pain comes from pancreatitis, additional factors come into play. Very often, the cause of the pain isn’t clear, making it hard for clinicians to address it. Sometimes, the reasons for pain are found outside of the pancreas (such as a peptic ulcer), which can be easier to treat once identified. Adding to identification and treatment complexity is that some patients have multiple sources of pain that can flare up at the same time or at different times. Clinicians have lacked CP-specific pain guidelines. Since there was no consensus on how to treat CP pain, care for patients has been inconsistent and has not always followed the latest science or considered all possible approaches. For instance, some doctors started the treatment regime by prescribing opioids while others refused to ever prescribe opioids. Or they might not have considered neuropathic pain, which occurs when nerves in the central nervous system become injured or damaged. The lack of a consistent pain management approach has left many chronic pancreatitis patients with pain that is frequent, intense, and often debilitating. Doctors need to take chronic pancreatitis patients’ complaints about their pain seriously. In addressing this pain, they must treat patients as individuals. Some patients respond to one drug, while others get relief from a different medication, a combination of medications or another dosing regimen. They should consider a broad armamentarium for treating pain, including complementary treatments such as acupuncture. Doctors should work with multidisciplinary pain teams in difficult cases, and not give up if their usual treatment is not effective. 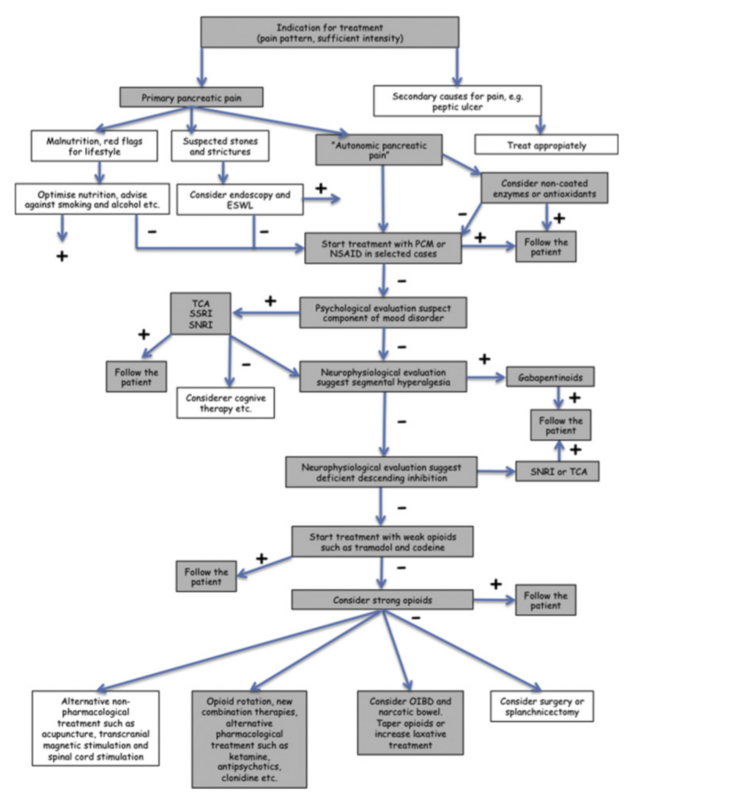 Fortunately, doctors now have a new tool: international consensus guidelines on treating chronic pancreatitis pain. [i] I led the working group that wrote the guidelines, which were released in 2017. Our group was truly diverse, with representatives from many fields–gastroenterology, endoscopy, surgery, psychiatry, and psychology—and many countries. We looked at a range of issues, to get the fullest possible picture based on existing knowledge, including types of CP pain, assessment tools, and the effectiveness of numerous medical, surgical, and psychological interventions. If pain is not relieved, conduct psychological evaluation and, if warranted, treat with appropriate medications (SSRI, TCA, SNRI) and/or cognitive behavioral therapy. If pain is not relieved, conduct neurophysiological evaluation where possible. These guidelines represent the treatment options with the most evidence behind them. There are other pain treatments that have not been researched as much but which could help patients. For example, mindfulness and cognitive behavioral therapy are two non-pharmacological treatments that are beginning to be tested for chronic pancreatitis pain. I also have seen hypnosis significantly reduce CP pain, although more research needs to be done. And there are several alternatives to opioids in development for other diseases and injuries that could help chronic pancreatitis patients too. The new guidelines have been downloaded more than 3,000 times since they were published—close to the record for Pancreatology, the journal that published them. That’s a great sign. I urge all clinicians to review and adopt the guidelines although they need to be adjusted according to the local clinical framework. I also urge all chronic pancreatitis patients to make sure their providers know about the guidelines and that they are receiving the most up-to-date standard of care. Patients should take the guidelines to their doctors and discuss them. Unfortunately, following these guidelines does not ensure that patients will be pain-free. We still have work to do to achieve that goal. Like Mission: Cure, I am committed to working to better understand chronic pancreatitis pain and to developing new treatments so chronic pancreatitis is no longer a debilitating, life-altering disease.